When Ivan's mother disappears, he's abandoned on the streets of Moscow, with little chance to make it through the harsh winter. But help comes in an unexpected form: Ivan is adopted by a pack of dogs, and the dogs quickly become more than just his street companions: They become his family. Soon Ivan, who used to love reading fairytales, is practically living in one, as he and his pack roam the city and countryside, using their wits to find food and shelter, dodging danger, begging for coins. But Ivan can’t stay hidden from the world of people forever. When help is finally offered to him, will he be able to accept it? Will he even want to? Bobbie Pyron has taken a bit of history and turned it into a captivating tale of a little boy's survival. Never could I have imagined a child's bond with wild dogs as seen in The Dogs of Winter! Ivan Andreovich is only five years old when his mother goes missing and her boyfriend tries to take Ivan to an orphanage. In the City, somewhere in Russia, Ivan decides to run away, hoping that his mother will come searching for him. He spends days and nights on the streets and train station, at first taken in by a rowdy group of young children who steal food and beg money for vodka and cigarettes. In the midst of these kids who will do anything to survive, Ivan tries to hold on to the morals his mother taught him like to not steal or lie. When the dogs come into Ivan's life it gets a little easier to make it. He finds food for them and himself, warm places to sleep at night, and protection from the older street kids and gangs. But, of course, obstacles take place that hinder Ivan's ability to keep himself fed and clothed. He's very naive throughout most of the story, but the more wild he gets the more cunning. Throughout the novel, Pyron makes me wonder whether anything will go right for the Dog Boy, but time and time again his pack proves that they have his back and they'll endure through the most dire situations. Except for when Ivan is captured and forced back into human society. I found that I didn't feel the big emotional pull until Ivan had been shown just one ounce of kindness from someone who wasn't one of his dogs. 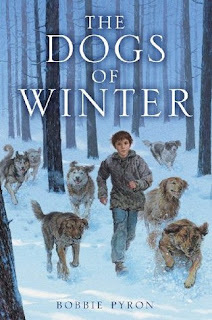 The Dogs of Winter is a novel that I would highly recommend to dog lovers and readers who love an encouraging tale of survival. Even through the darkest parts of the novel, when life just wasn't kind to little Ivan, the dogs lightened the pall. Thanks for taking part in the tour. It sounds like you loved the book as much as I did! I very rarely read books more than once but this is one I will have to read again.